oh it's so big! I can't wait to see what goes where! what a great garden! but may I offer a suggestion? I have a raised bed garden about the same size. I regret the 4-foot-wide beds...3 feet would have been much easier to work, but I understand the fierce desire for as much space as possible. Also, you may want to consider a hardy kiwi for over your arbor...they're prolific and they taste great! Will you be pumping water from the pond? I've had two gardens now with 4 feet wide beds, and this is what works for me. I rarely work the beds from the paths - I use boards that I lay across the beds width-wise that I use to stand/squat on and work the beds. The boards provide dividers to the patches of crops. It seems it would be hard to plant large crops like squash, potatoes, corn in 3 foot beds. But maybe its a preference/style. I will make larger paths in my new garden, as I want to be able to get the wheelbarrow in and to be able to rake the paths. Also, since I plant intensively, wider paths will help force me to leave some space. In the past I have have 8-12 inch paths, but am planning 15 inch paths, and larger on the main path. 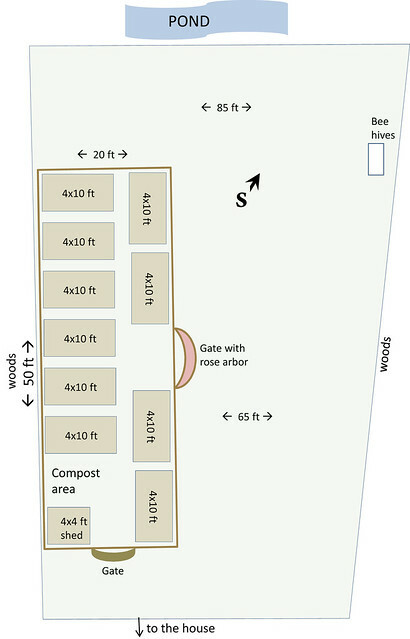 Now that I have a draft diagram, I want to go down to the garden area and make some more measurements and draw everything to scale better. Hopefully I can do this before the next snow storm. Sunshine, Bren! That's awesome. Thanks! We had a spigot installed this fall that will give us Town water for the garden. This seems more enviromentally conscious. I don't want to use up pond water and don't want any of my garden runoff going into the pond. The runoff will all be organic, but still want to reduce any impact on the local wetland. Thats one reason for goign with raised beds, less runoff. We will lay timbers just inside the fence ( a 5 foot deer fence) to also contain runoff. Lincoln Town water comes from another local pond - Flints Pond. Actually, I don't know why it is better to use this water. Of course it costs more, it's pumped over here. I suppose even if our runoff doesn't go directly into the pond, it will seep into the ground and eventually make it into the pond.